DESCRIPTION: IWS assisted with the value engineering and design and reduced the overall construction costs by $174,000, which represented a 25% overall project cost savings for the client. In the Fall of 2005, Integrated Water Services, Inc. (IWS) responded to a Request for Proposal issued by The Yolo County Housing Authority (YCHA), to provide improvements to a drinking water supply system serving the Fred R. Rehman Migrant Center, a migrant farm workers housing facility located in Dixon, CA. IWS reviewed the Bid Documents, plans and specifications, and submitted our proposal to the YCHA. IWS was awarded the bid for $670,000 as the lowest responsive responsible bidder. This amount was nearly $200,000 over the available funds for the project.IWS initiated discussions with the Housing Authority and suggested we could provide value engineering services to further reduce the project costs and improve the drinking water system’s constructability. As a partner with the YCHA Engineer (Dave Dauwalder), IWS assisted with the value engineering and design and reduced the overall construction costs by $174,000, which represented a 25% overall project cost savings for the client. The value engineering focused on the electrical and programable control system costs, which were reduced by simplifying the configuration. The net result was an affordable constructed cost for the client and simple and affordable future operating costs. The Migrant Center is utilized seasonally by migrant workers during the spring and summer each year. The project was funded in partnership with the State Department of Housing and Community Development, Office of Migrant Services. 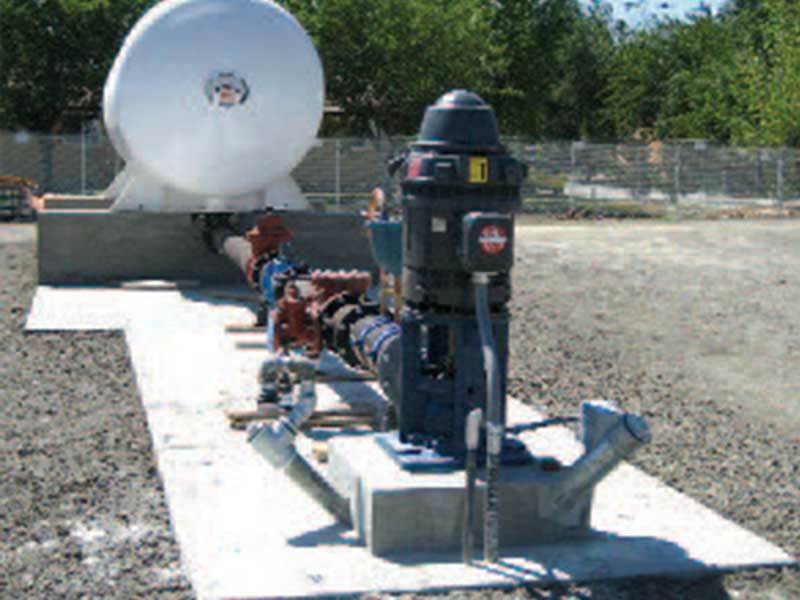 The existing water service for the housing facility had been provided via connection to an adjacent US Navy facility. The YCHA, as part of their site requirements, installed two new wells and completed an initial design for the new well head improvements, water treatment, and distribution system improvements needed to accommodate the planned disconnection from the Navy’s supply. The IWS scope of work included the installation of two new 50 hp Goulds deep well turbine pumps, control system, well head improvements, disinfection equipment, two 5,000 gallon hydropneumatic tanks, well discharge piping, site preparation, grading, access road construction, and tie inconn ctions to the distribution grid.